In 1966 for the first time the All Star Game MVP was awarded to a player from the losing team. 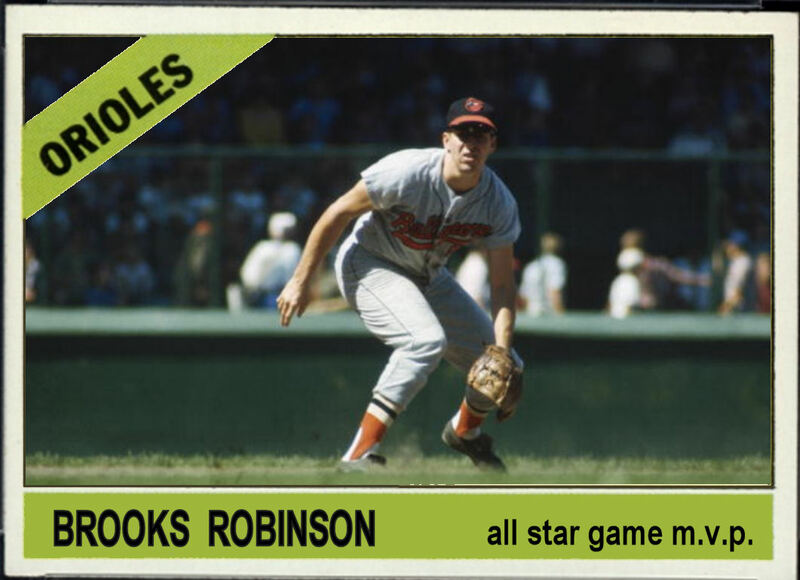 Brooks Robinson went 3 for 4 and scored the A.L. 's only run (unearned) in the second inning. He tripled then scored on a wild pitch from Sandy Koufax to give the Americans an early 1-0 lead. 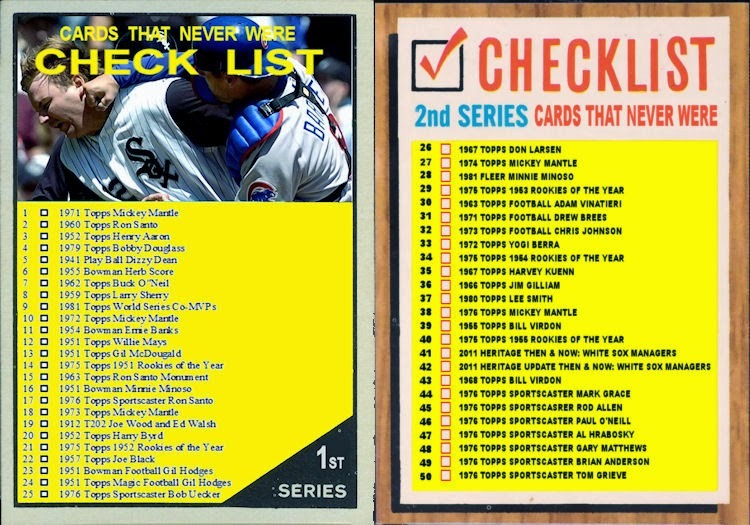 Ron Santo drove in the tying run in the bottom of the 4th and Maury Wills singled in Tim McCarver in the bottom of the 10th inning. The N.L. won their 4th consecutive All Star game. The MVP is selected by a committee of executives and sports writers in attendance. Given the 105 degree heat and humidity of the day, the committee may have chosen the MVP and adjourned prior to the N.L. 's comeback. 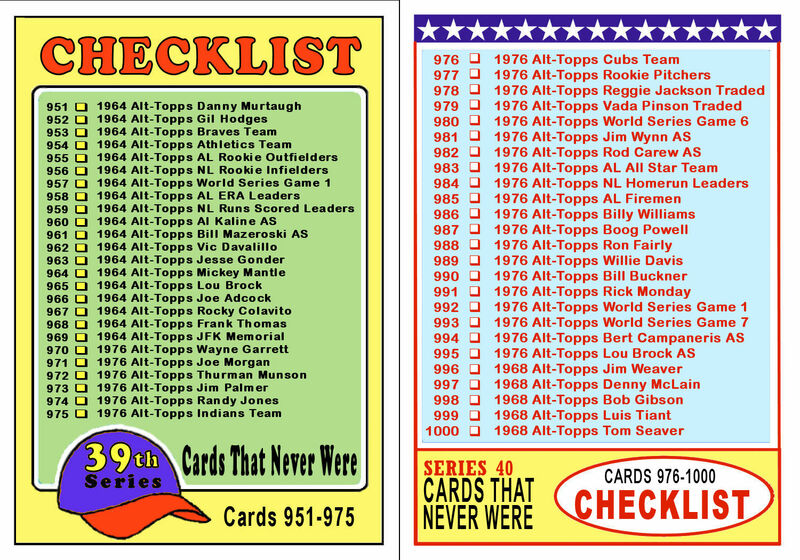 For those who actually read this blog, you know that I've been filling in the missing Mantles from 1971 -1995. 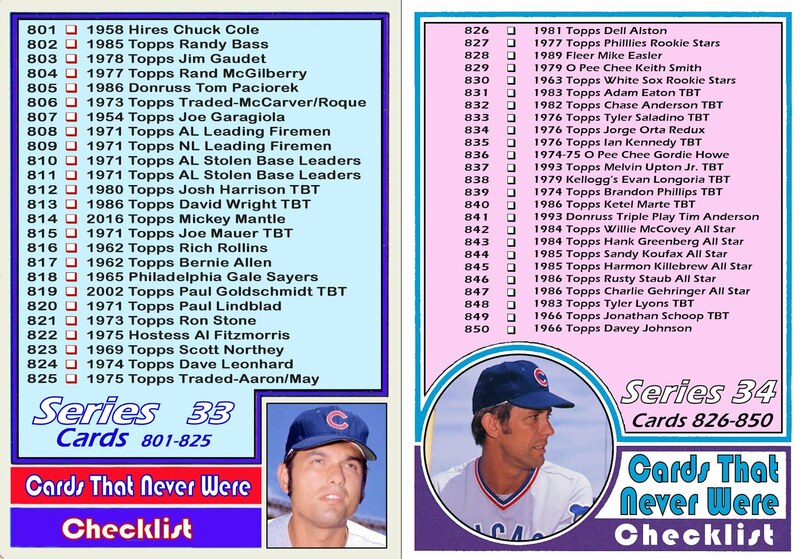 Topps has created quite a few Mantle Cards That Never Were. Including cards that had no real reason to exist, specifically the cards of Mickey Mantle that were issued well after he retired. 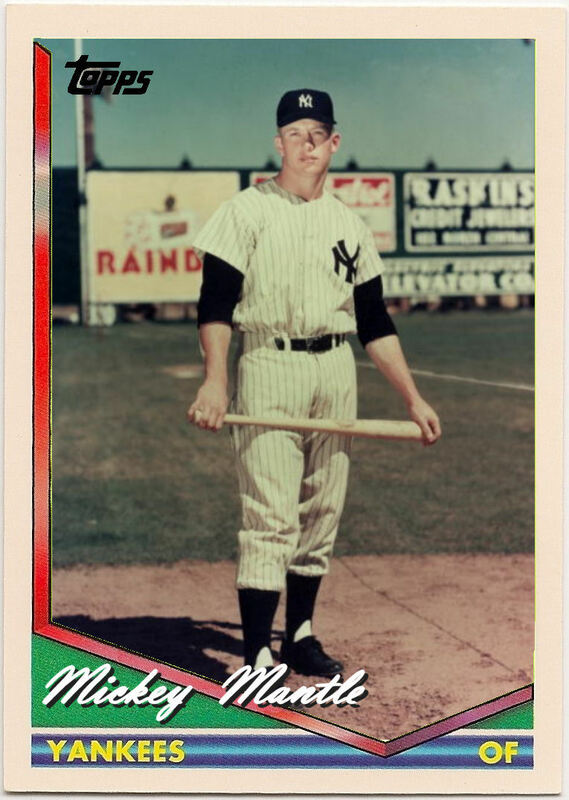 In 2006, more than 10 years after The Mick passed on, Topps began issuing a Mantle card in every set, number 7. 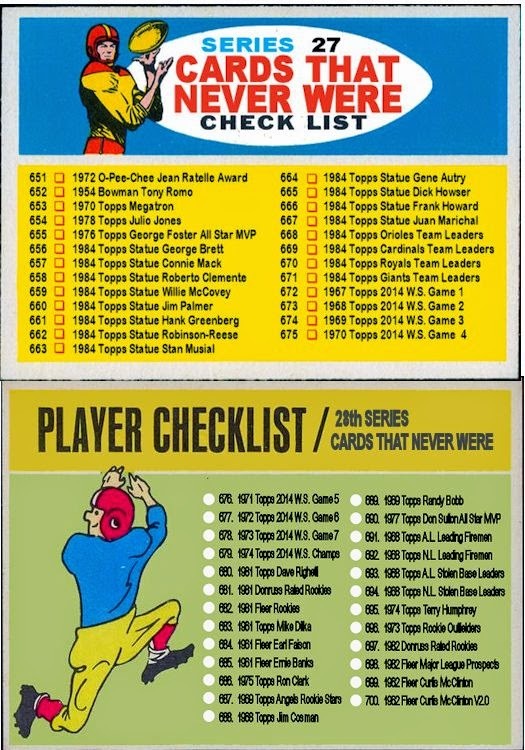 Since then they have also issued cards that they missed including a 1970 Walmart only, mini cards from 1975 and 1987 plus the years 1996-2005. 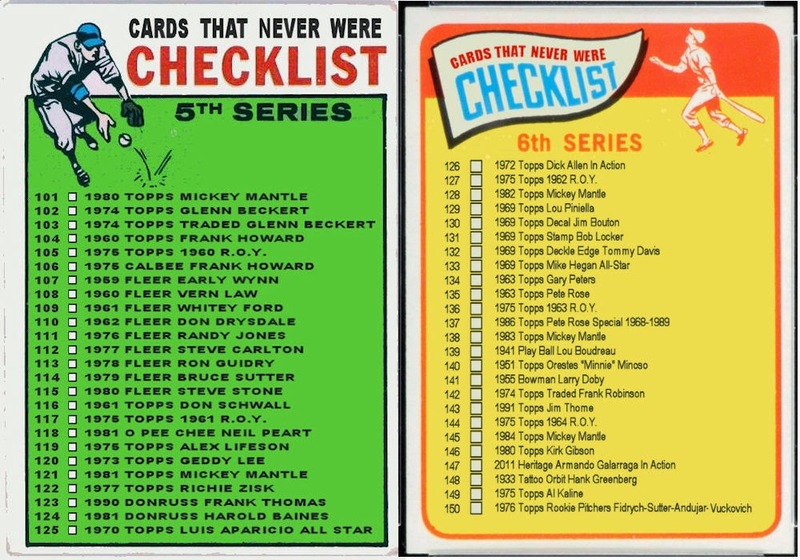 This year, no Mickey Mantle card. No number 7 card. What gives? Do they need to renegotiate with his estate? Did they decide that this was a silly endeavor suited more for a time-wasting blogger than a multi-billion dollar industry? I don't know, but I will tell you this: If it doesn't materialize by the series 2 release date (Last estimate June 11th), look for it here. 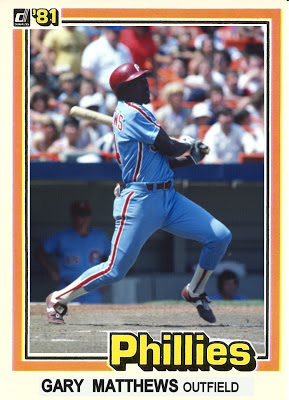 In the spring of 1981 the Phillies traded Bob Walk to the Braves for Gary Matthews. Bob Walk was 11-7 as a rookie pitcher on the 1980 Championship Phillies and showed promise. However in 1981 Walk would just win a single Major League game for the Braves. Meanwhile Gary Matthews would hit .301 with 9 homers and 67 RBIs in the strike shortened season of 1981. He would be one of 4 Phillies to receive MVP votes that season along with Pete Rose, Steve Carlton and 1981 NL MVP Mike Schmidt. Since Al Bumbry's All Star season in 1980 his numbers gradually declined. 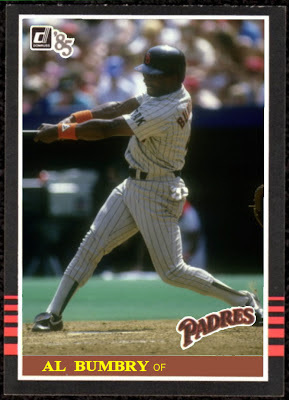 In 1985 at the age of 38 he was signed as a free agent by the NL Champion Padres. Bumbry managed to see action in only 68 games that season and barely hit at the Mendoza line. So after 13 seasons in an Oriole uniform and just one in a Padres uniform, he called it quits. 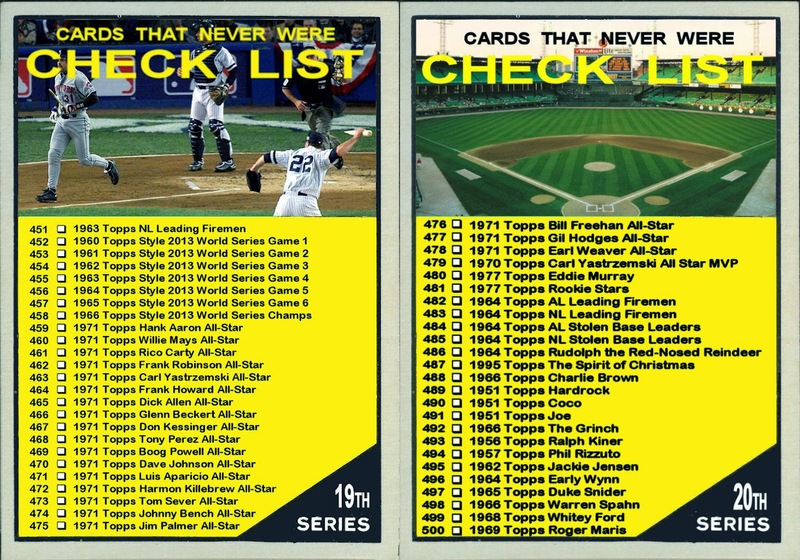 Once again I chose a Donruss product for my updated card. First, The 1985 set is one of the better looking sets of the era. 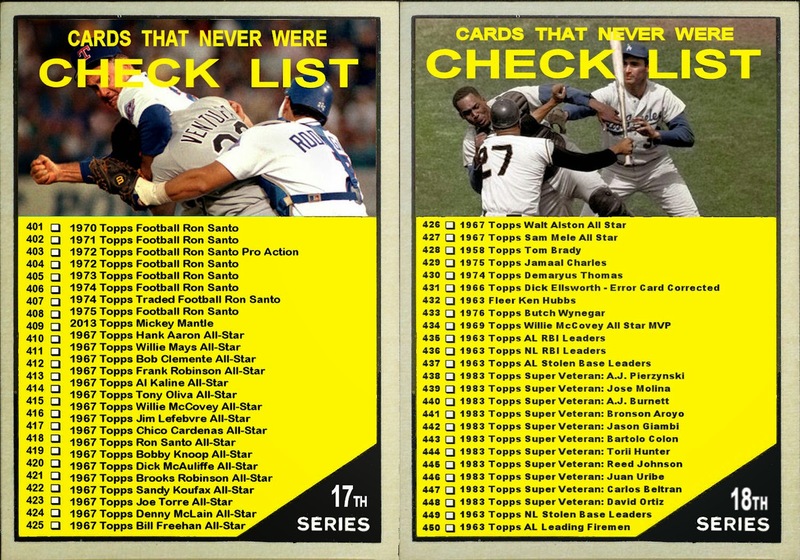 Second, Donruss still didn't have a traded set. That leaves so many opportunities for a blog like this. 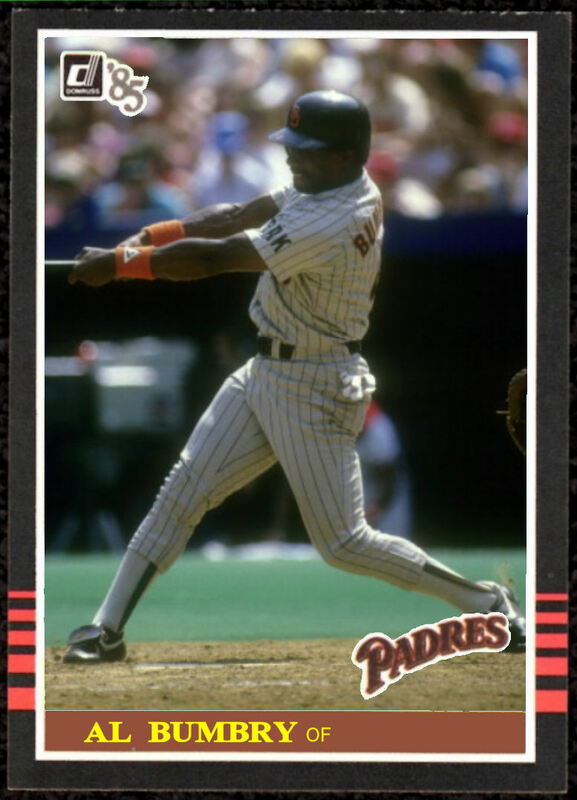 Bumbry was featured as an Oriole in all the major sets in 1985 but as a Padre only in 1985 Topps Traded and the '85 Fleer Update. 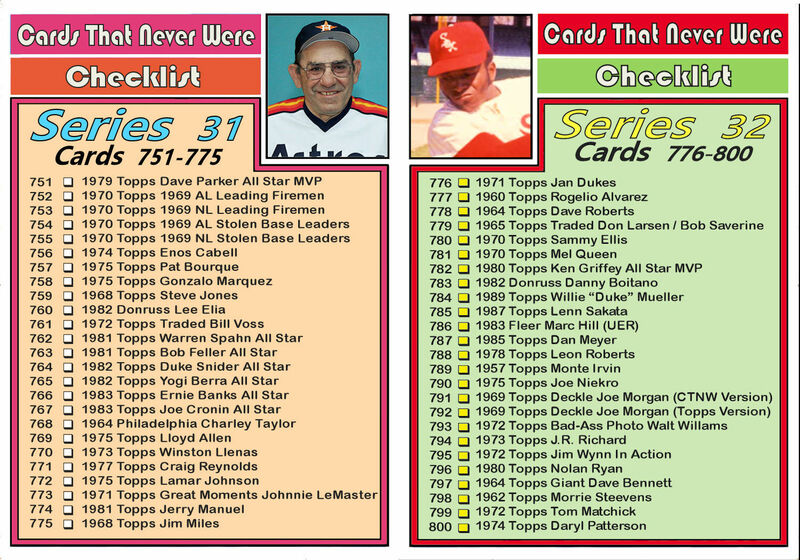 1973 marked the last year that Topps release cards in multiple series. 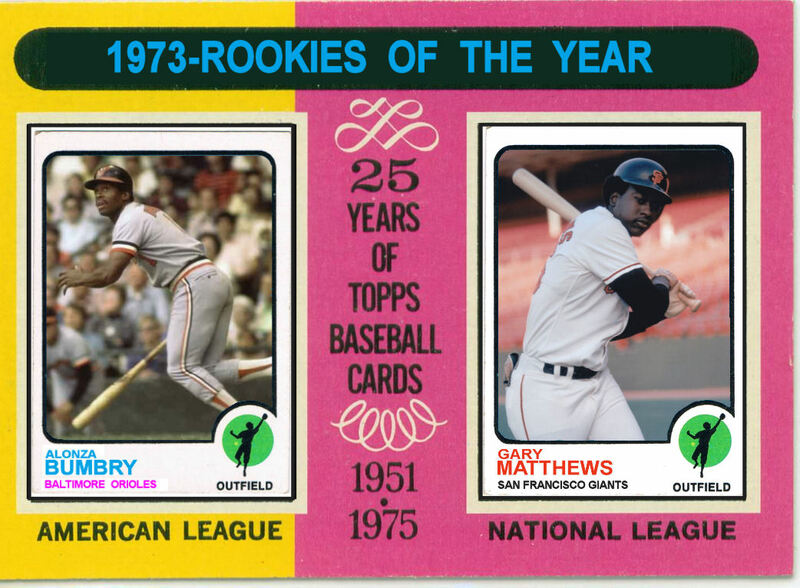 Most of the Rookie of the Year candidates were immortalized on cardboard that year. That is no small task as there were 14 different players receiving ROY votes. 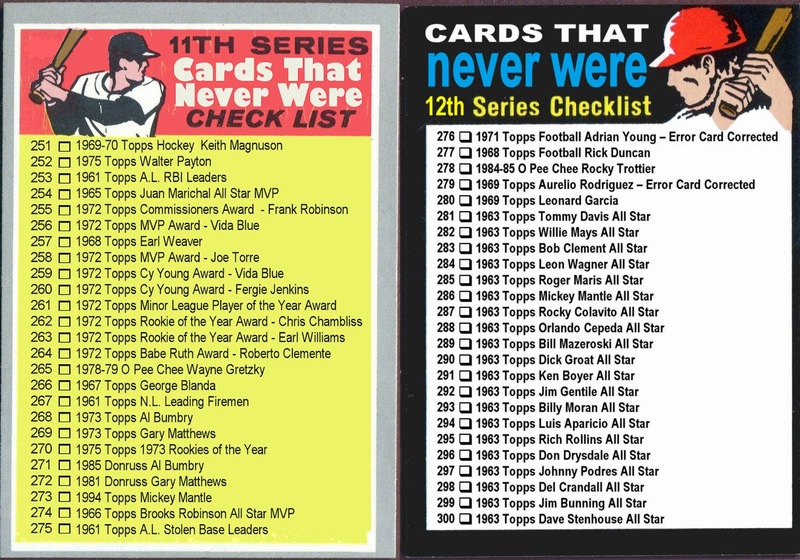 (15 if you include Richie Zisk who is included on the Baseball-Reference.com NL ROY list despite apparently receiving no votes?) 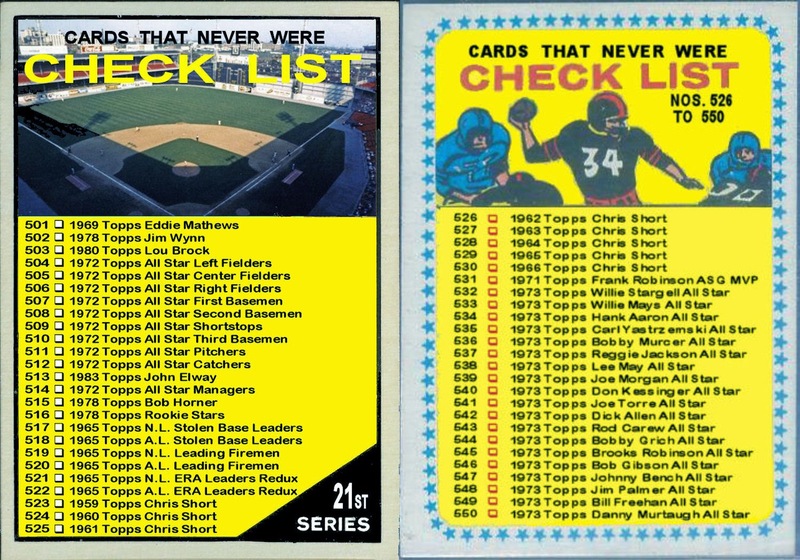 Of the 14 (or 15) only 4 didn't have a card in 1973. 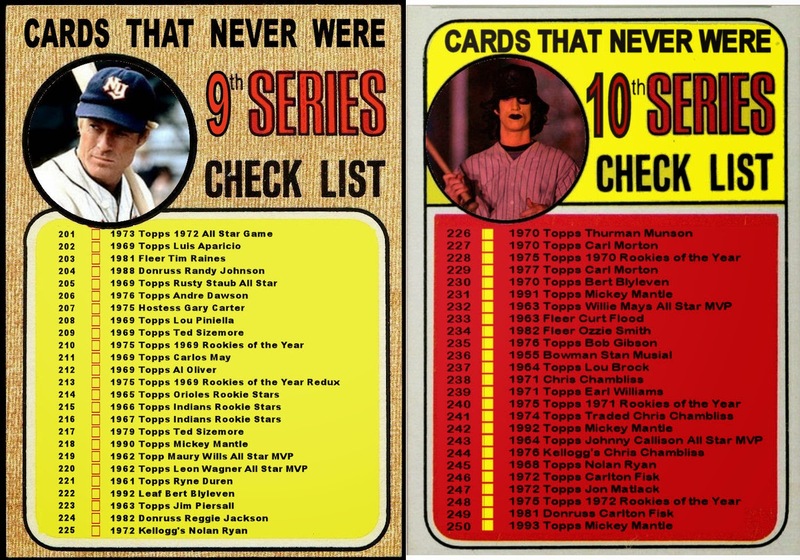 All 11 appeared on cards in the 5th and final series. 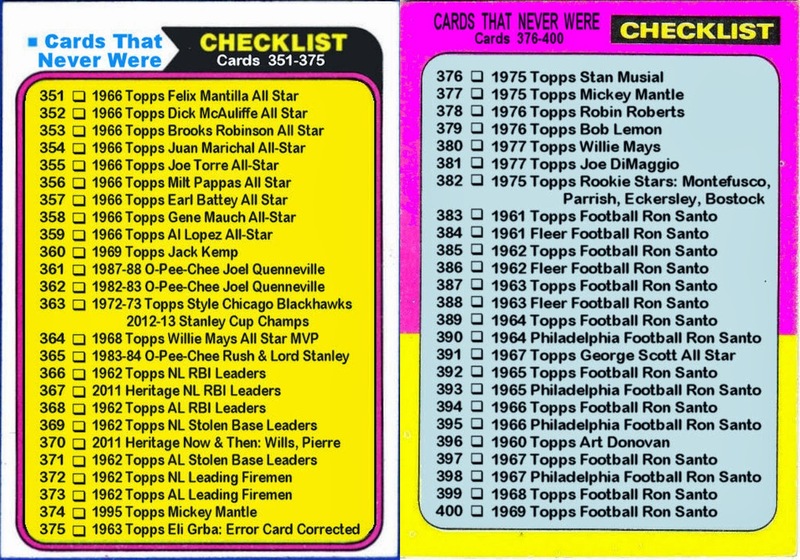 In 1974 the Topps baseball wax packs declared "All 660 Cards in One Series". That year only 3 of the 8 ROY candidates would have cards. 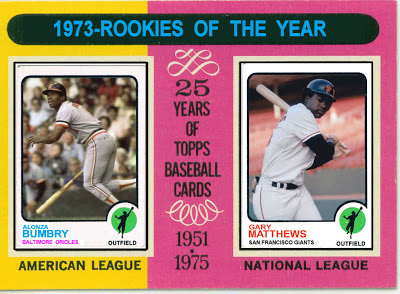 That trend would continue with only 21 of 46 ROY candidates having cards in their rookie season from 1974-1979. 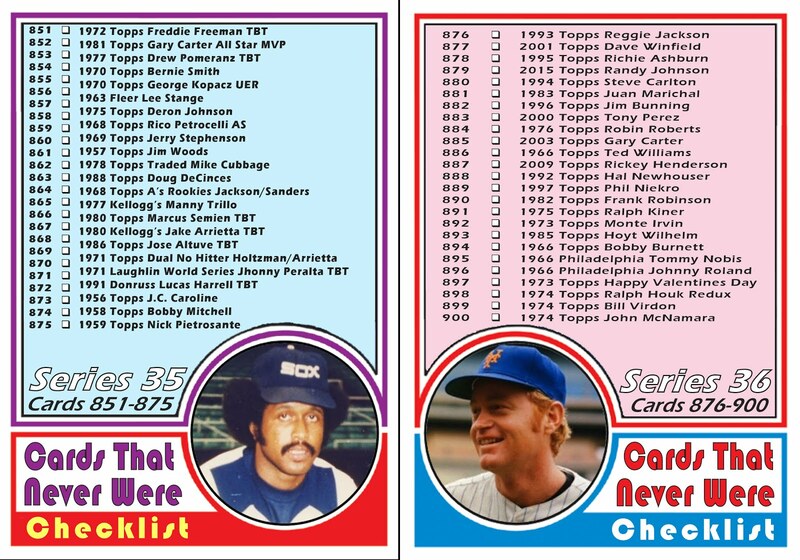 But in 1980 there were 16 different players receiving ROY votes and not a single one of them had a 1980 Topps card. 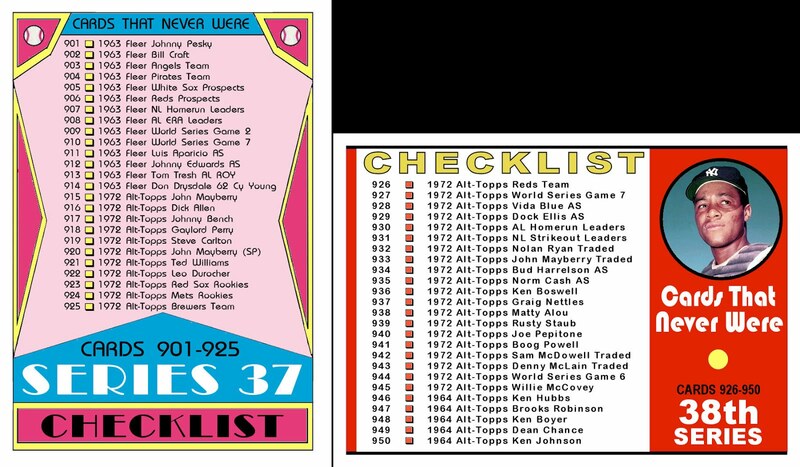 In 1981 Topps would add a "Traded Series" but it wouldn't be until the 1983 that Topps would fully use the potential of the Traded set to include rookie stars. 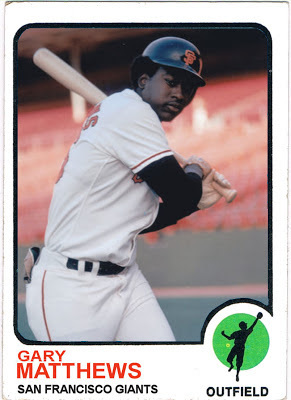 10 of the 13 ROY candidates had cards in the 1983 Traded set. 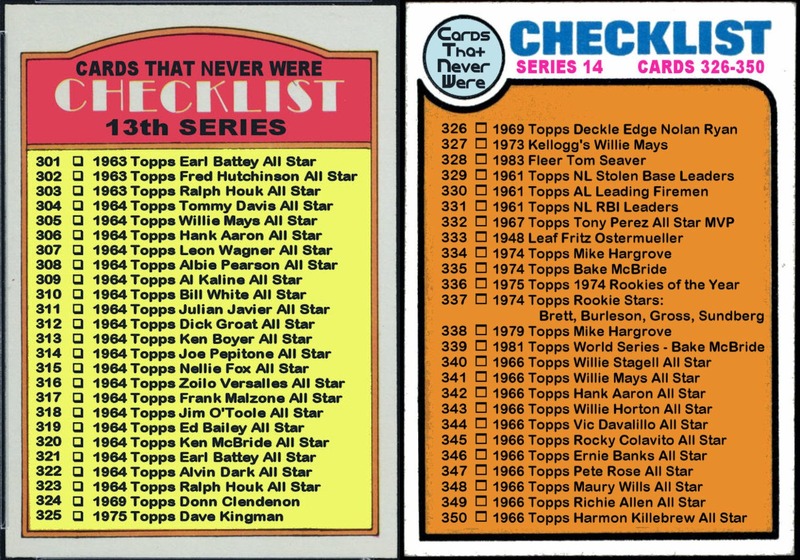 1983 coincidentally (or not) would also be the first year since 1960 that Topps would not have multi-player rookie cards. Gary Matthews was the Giants 1st round pick in the 1968 draft. He steadily progress from A to AA to AAA from 1969-1972 and was a September call-up in 1972. He was the Giant's opening day left fielder in 1973 and put up some very respectable numbers for the season. He hit .300 with 12 homers and 17 stolen bases. He was awarded the Rookie of the Year ahead of several solid players including Ron Cey, Davey Lopes, Bob Boone, and Richie Zisk. 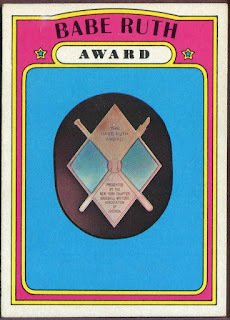 There is a phrase among card collectors "Stars and Semi-Stars". 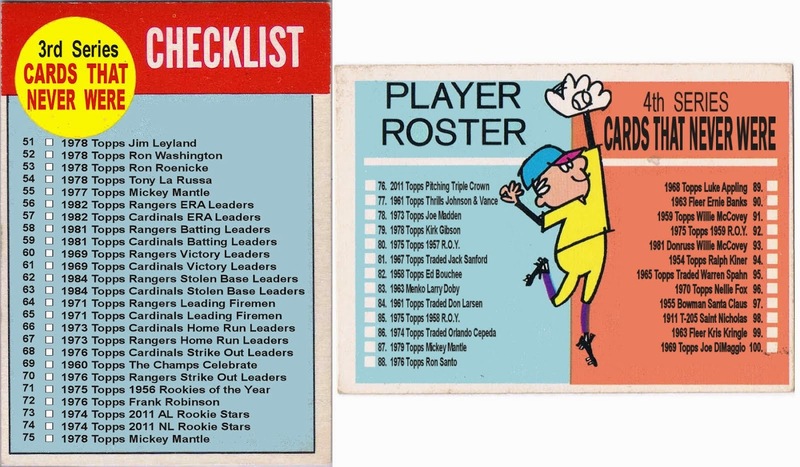 The list of Rookie of the Year candidates in 1973 seemed to define "Semi-Stars" of that era. All solid players, occasional but not perennial All Stars. All of them are fan favorites and a nice pull from a fresh pack when we were still young enough to enjoy that stick of gum that came along with them. 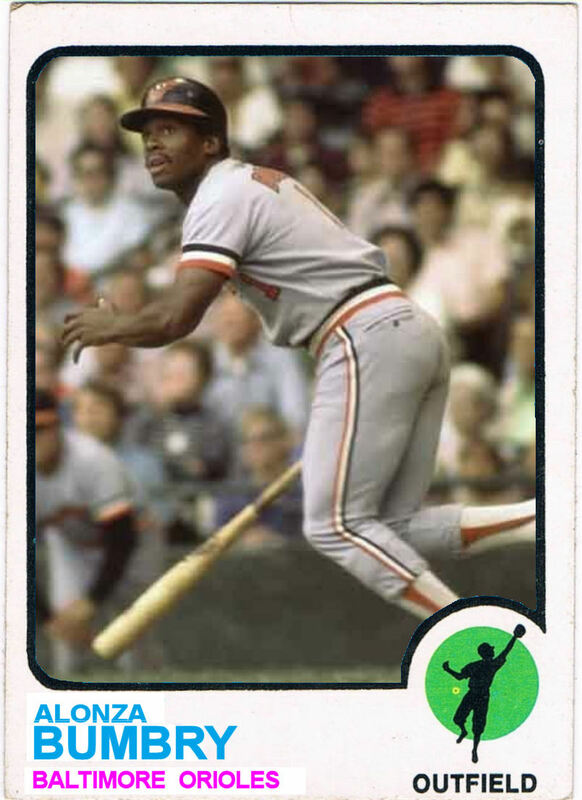 Al Bumbry stole over 30 bases in both 1971 and 72 and hit .336 and .345 respectively while advancing from A through AAA in Baltimore's farm system. He was a September call-up in 1972. 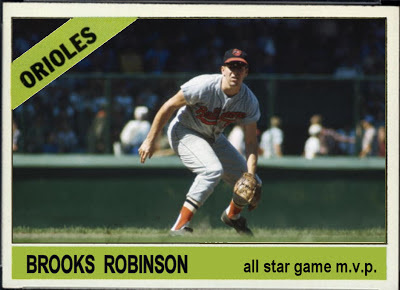 In 1973 he showed his speed as a regular in the Orioles line-up. He led the league in triples and stole 23 bases while hitting .337. 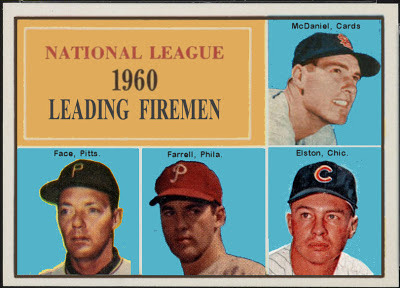 In 1961 Topps began issuing League Leader cards. 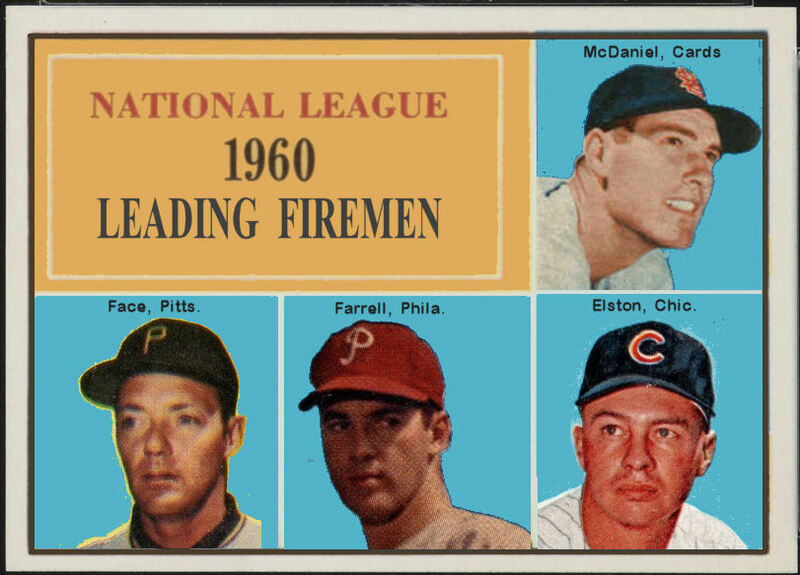 Although the save would not become an official stat until 1969, in 1960 The Sporting News began presenting the Fireman of the Year Award to the top relievers. It was not a direct reflection of most saves but a combination of relief wins and saves. Lindy McDaniel was the first N.L. recipient of the Fireman of the Year award with 26 saves and 12 wins. He was selected to both All Star games in 1960 but only saw action in the second game. He pitched 1 inning giving up a single in the National League's 6-0 rout of the American League. In addition to his All Star selection, he received votes for both the Cy Young and MVP awards. Roy Face of the World Series Champion Pirates came in second with 24 saves and 10 wins. Face was also an All Star in 1960. He came into game 1 with 1 out and bases loaded in the bottom of the 6th and got Hall of Famer Luis Aparicio to ground into an inning ending double-play. He followed that up with a perfect 7th inning, getting 2 strike outs and a ground out. Oddly, it was his teammate and 1960 Cy Young award winner, Vern Law, who would have been award the Save had it been an official stat in 1960. Face was followed by Turk Farrell of the Phillies with 11 saves and 10 wins and Don Elston of the Cubs with 11 saves and 8 wins. The 1966 Houston Oilers started the season with George Blanda under center. Blanda at 39 years old went 3-5 as the starting QB. The Oilers decided to go with the 25 year old Don Trull for the remainder of the season. They were winless. After the season they felt Blanda was used up and dropped him. 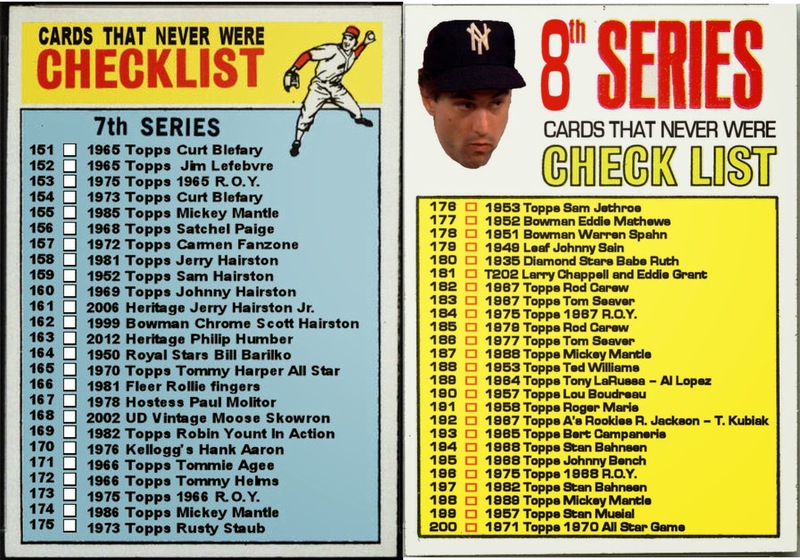 Apparently Topps did as well. 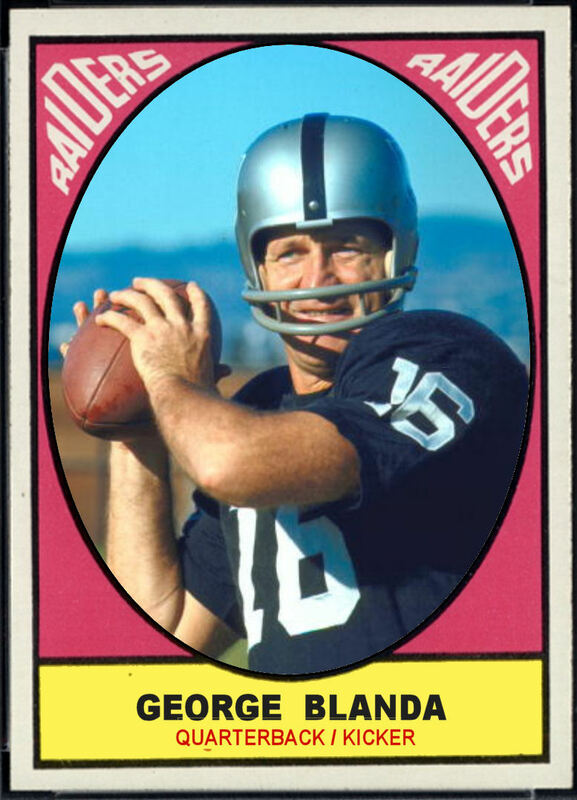 There was no 1967 football card of the 40 year old George Blanda on his new team, the Oakland Raiders. Blanda would primarily be the Kicker and back up QB to Daryle Lamonica. He ended up leading the AFL in scoring and was selected to the All Star Game that season. 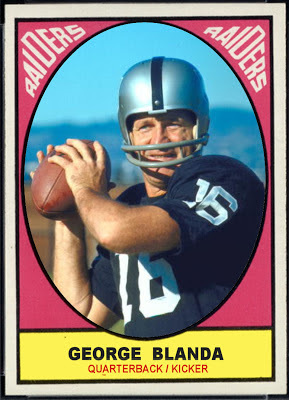 1967 was the first of 9 season with the Oakland Raiders. Blanda would eventually retired a month before his 49th birthday. He would be a 1st ballot Hall of Famer in 1981. 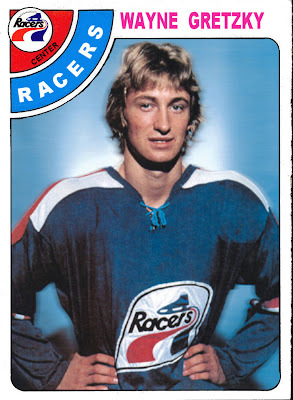 At 17 years of age, the Great One began his career skating for the Indianapolis Racers of the World Hockey Association. He would be sold to Edmonton early in the season. The following season the Edmonton Oilers, Hartford Whalers, Quebec Nordiques, and the Winnipeg Jets would be the only WHA teams to become NHL franchises. The Whalers would eventually move to Carolina and become the Hurricanes. The Nordiques became the Colorado Avalanche. The Jets moved to Phoenix and became the Coyotes. (The Jets returned to Winnipeg last year with the purchase of the now defunct Atlanta Thrashers.) Only the Oilers franchise has remained uninterrupted since the NHL expanded to include the WHA teams. Rumors of the NHL returning to Connecticut have been denied by both the NHL and the Connecticut Governor. Quebec City is currently building a $400 Million arena in hopes of the NHL returning in 2015. The NHL, however, has made no such plans publicly. 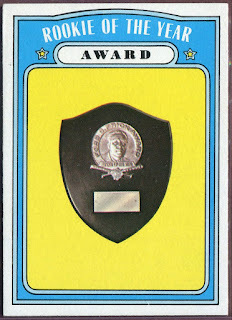 In 1972 Topps released 6 "Awards" cards. These cards had pictures of the trophies on them. I always thought that was kind of strange. 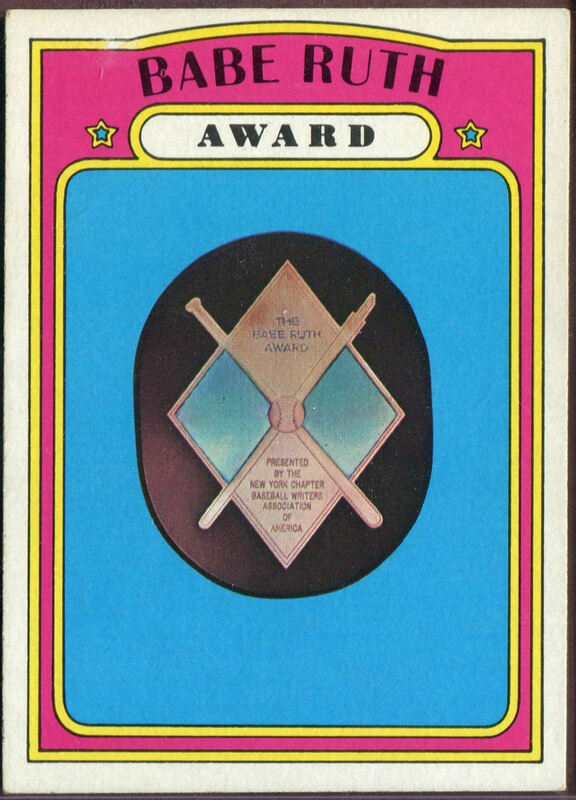 Over the past few posts I've been putting pictures of the award winners on the cards. 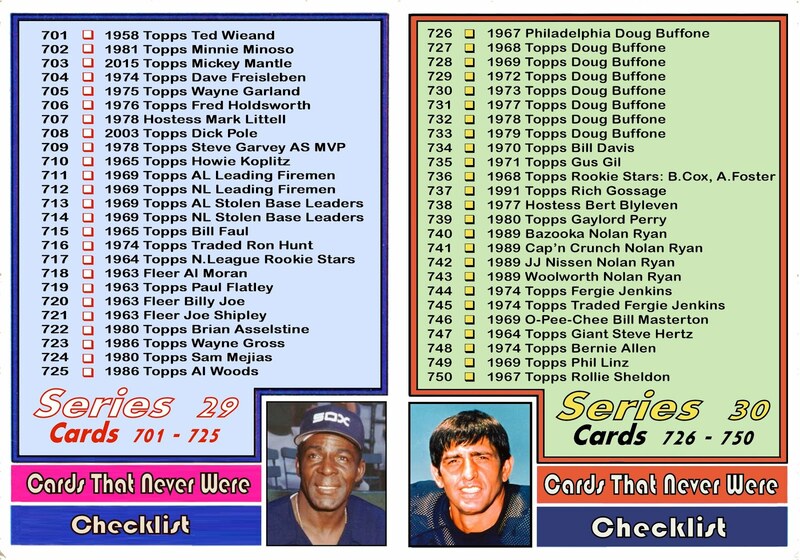 I added facsimile autographs to identify the players while trying to keep the original look of the cards. 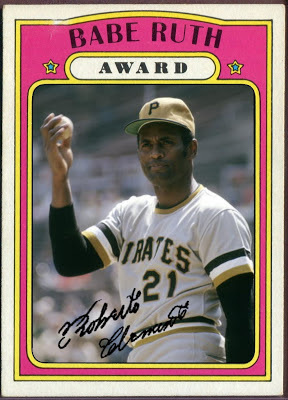 Roberto Clemente was the recipient of the Babe Ruth award in 1971. At that time, the Babe Ruth award is given to the Most Valuable Player of the World Series. Currently it is given to the post-season MVP. There were actually 2 awards given separately for the World Series MVP in 1971. (More information here) Clemente was the winner of both awards in 1971. He hit safely in all 7 games, including homers in game 6 and 7. 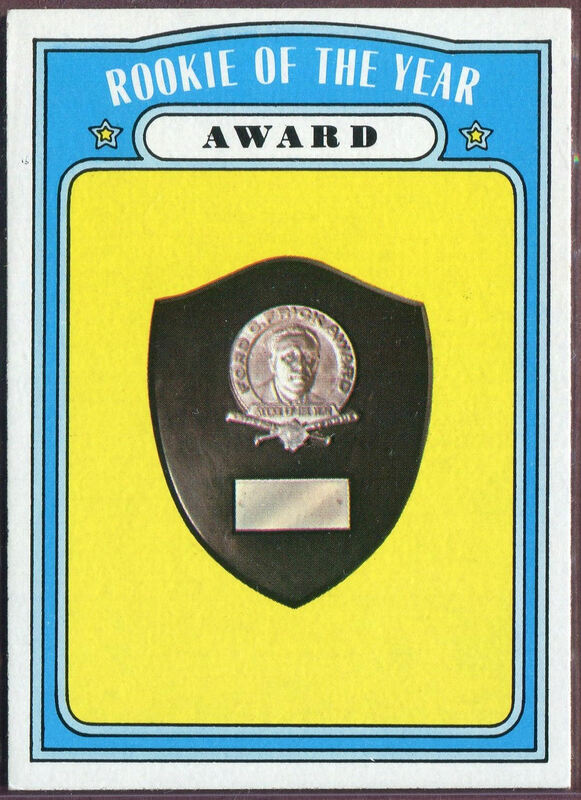 In 1972 Topps released 6 "Awards" cards. These cards had pictures of the trophies on them. I always thought that was kind of strange. Over the next few posts I will be putting pictures of the award winners on the cards. 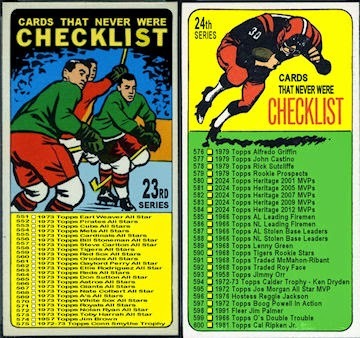 I added facsimile autographs to identify the players while trying to keep the original look of the cards. 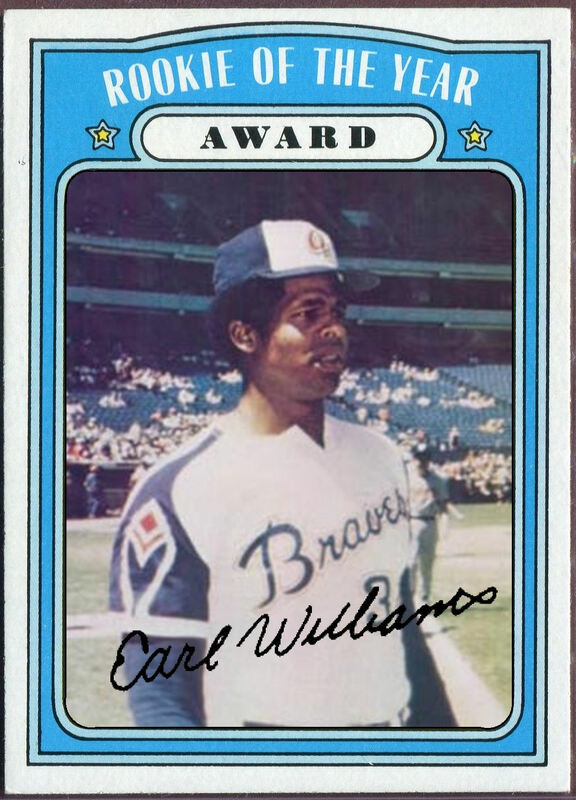 Earl Williams was a pitcher in high school when he was drafted by the Braves in the first round of the 1965 draft. As a minor leaguer in the Braves' system he would pitch only 8 games before becoming a position player. He played first, third, and the outfield. He even played a game at shortstop but he didn't play catcher until the 1971. His began his MLB career in 1970 platooning at 1st and 3rd. By June of 1971 he had found a home behind the plate. He hit .260 with 33 homeruns making the Braves opening day catcher, Hal King, expendable.